A one-time donation is always a win for nonprofits, but financial sustainability is heavily dependent on repeat donors. It is more cost-effective to retain a donor than recruit a new one, but what does “retain” really mean? Ultimately, retaining a donor means getting them to donate again. And in order to do that, you have to take a calculated and tactful approach. The strength of your donor relationships is built in the time between gifts. Working to engage your donors and make them feel appreciated in the months following a gift will set you up for success when the time comes to ask for a second donation. By thanking and engaging the donor, you pave the road for future support. Your first step to getting a donor to give repeatedly is to make sure the donation process ends with a heartfelt thank you. This is a vital step in the giving experience and overlooking it puts you on the fast track to donor attrition. Supporters should receive an email with a brief thank you and receipt immediately following any online gift. Modern fundraising software can do much of this work for you. These initial thank you messages should NOT include another ask or appeal. Show the donor their help is notable and appreciated before asking anything more. This message is about celebrating what the donor has already done. Many nonprofits struggle with the question of how long to wait before asking for a second donation. On one hand, you don’t want to appear needy or ungrateful. On the other hand, you need ongoing support and don’t want to miss out simply because you didn’t ask. Last year, Software Advice, a company that reviews donor management software, published the findings from their survey of 2,833 adults on their preferences when it comes to donation follow-up. One question asked participants how long nonprofits should wait before asking for another gift, and the results can help us in setting some guidelines. The most popular choice among respondents, with 35 percent, was that organizations should wait 7 to 12 months. Twenty-eight percent said that nonprofits should wait more than 12 months. 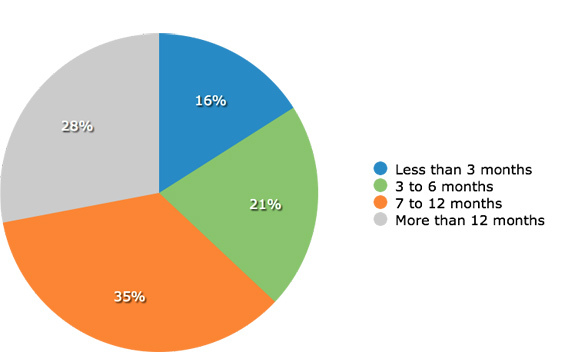 Survey participants’ responses when asked when nonprofits should ask for a second donation. A year is a long time to wait before asking for a second donation and 37 percent of those surveyed were open to being asked within the first three or six months. While there is no hard and fast rule for how long your organization should wait, this data suggests that six months is a reasonable guideline. Waiting to ask for a second donation, however, does not mean you should not communicate and engage with your donors. While you should reference the impact a donation will make in your thank you, you can go into greater detail in future correspondence. Updating donors on the progress you make helps to build trust and foster pride in your work. Annual or quarterly reports are an industry standard for donor communications, but it can be even more powerful to send updates on individual projects or programs a donor supports. For example, if you have a fundraising campaign to build a playground in a struggling neighborhood in your city, update donors to the campaign on this project. You can start as soon as the campaign ends by sharing the fundraising results with donors and telling them how you plan to get started on the work. Later on, send them a picture or video of the playground’s construction. When the playground is open for local families to enjoy, reach out again and let your donors know. Give them the satisfaction of seeing the end result of their contribution. Some nonprofits make proving their impact an ongoing commitment. When someone donates to Watsi, an organization that funds medical procedures for the poor, they get an email update on the patient they helped. The clean water nonprofit Splash has an entire microsite devoted to mapping and proving the impact of donations. Even if it’s just a quick email update or a picture from the field, proving the impact of a donor’s gift provides the satisfaction and credibility needed for retention. Data suggests that donors want nonprofits to wait several months before asking for a second gift, but that doesn’t mean you can’t engage with these donors and ask for other forms of support. Make sure your emails include social follow buttons to spread your content. This gives you more opportunity to reach your supporters and their friends and family. Events are another great way to get donors involved in the months following their gift. Even if it’s too soon to ask for a regular donation, let them know that your charity run/walk is coming up and they can now register. Finally, peer-to-peer fundraising is a good option for donors who want to stay involved with your mission but aren’t ready to donate again. Birthdays in particular are ideal for promoting year-round fundraising. Many people look for unique ways to celebrate and they may jump at the chance to unite the celebration with their passion for your work. Four to six weeks beforehand, send an email with information on how to create and promote a birthday campaign. Following a donation to your nonprofit, you should continue to communicate with the donor to express your thanks, show how their gift made an impact, and share opportunities to get involved. The exact timing of your donation appeals will be influenced by the makeup of your organization and donor base, but the majority of donors don’t want to be asked within six months of their first gift. Nevertheless, these people have shown interest in your work, so it’s worthwhile to keep them in the loop. Following a one-time donation, emphasize your gratitude for the help they’ve already given and frame your relationship as a partnership for impact. Show donors their involvement matters and give them the information and opportunities to be an ongoing advocate for your cause.